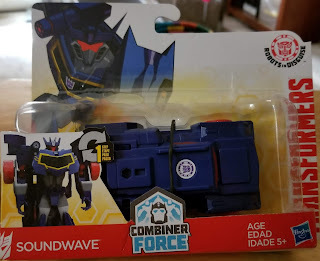 After putting it off forever, I finally bought the One Step Changer Soundwave from Robots in Disguise and boy are my arms tired. Mainly because I've been changing him back and forth over and over. I had been intending to get Heatseeker before Soundwave, but as I never see him anymore, I just grabbed Soundwave and don't regret it at all. Soundwave is a classic Transformers character that's Robots in Disguise design just looks great. 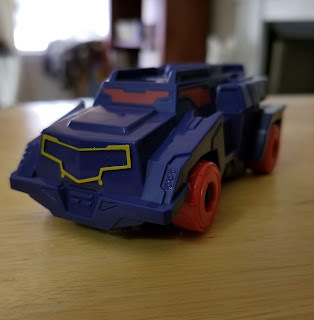 In vehicle mode Soundwave is some sort of boxy truck/SUV/Crossover thing that fits for a modern update. He looks like he'd fit in with late Euro G1 or with most G2 toys. Which I've noted before is my draw to these more simple toys in that they're seemingly lost toys from that era. 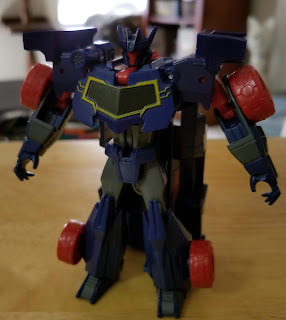 Soundwave transforms extremely simply (per the gimmick). Just pull the front of the truck over the robot and the parts mostly arrange themselves into place with a small amount of adjustment. They really should call these One Step and a little fiddling Changers, or as they're known these days, Turbo Changers. Soundwave looks great in robot mode. Like most of these Turbo Changers, he's limited in articulation, really just arms and head. Which is fine as it's a simple toy and like I said... it feels more like an older toy. He's got a decent paint deco going on, looking like classic Soundwave well enough. I can't help but to wish his cannon fired or he had some sort of other weapon. He just needs some big honking accessory to polish off the presentation. Either way, for the price and for just the toy on it's own, it's pretty great.